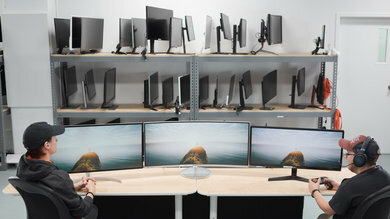 It can be difficult to choose a new monitor, as they vary greatly in size, shape, and performance. 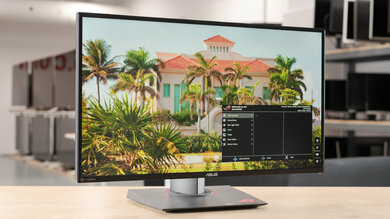 There are different types of monitors depending on how you plan on using it, and there is no catch-all monitor that is perfect for everyone, but some monitors are more versatile than others. 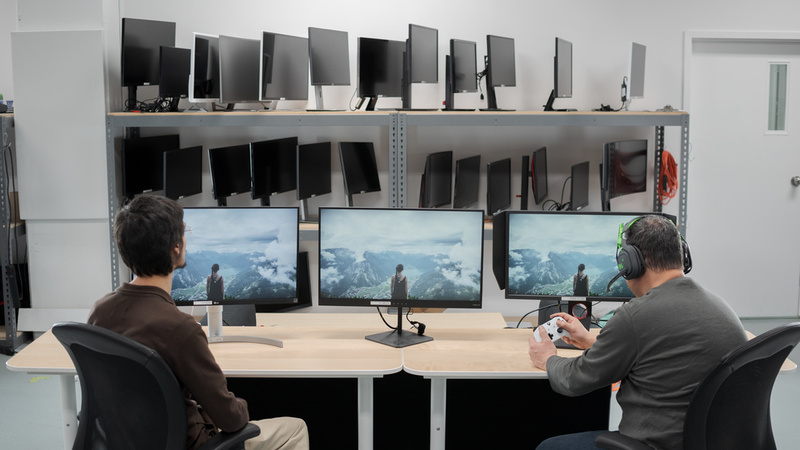 From ultrawide office monitors to high-performance gaming monitors, there is something for everyone on this list. 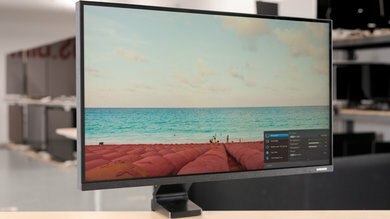 We've reviewed 64 monitors so far, and below you'll find our picks for the best monitors available for purchase in 2019. 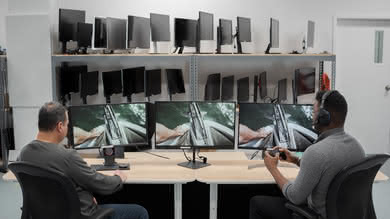 You can also check our recommendations for the best gaming monitors and the best 4k monitors. The LG 27UK650 is the best computer monitor that we have reviewed so far, considering size and price. It is a very good 27" monitor that is great for pretty much any use. It has an excellent 4k resolution, great for multitasking or for a more immersive gaming experience. It has wide viewing angles, so you get an accurate image even when you're not sitting directly in front of it. Gamers will appreciate the UK650's low input lag and fast response time, but more serious gamers may be disappointed by the 60Hz refresh rate. 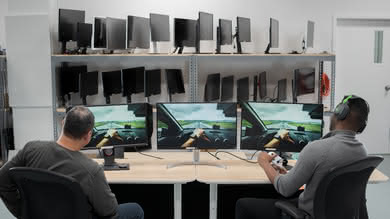 It supports FreeSync, which is great, but due to the 60Hz refresh rate, the VRR range is quite narrow, so you may still experience screen tearing in graphically intensive games. The LG 27UK650 isn't perfect, though. It supports HDR, but it can't get very bright in HDR and doesn't have a wide color gamut, so HDR content won't look as good as it should. It also doesn't look as good in a dark room due to the mediocre contrast ratio and sub-par black uniformity. 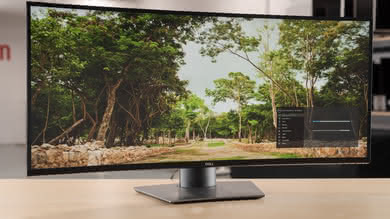 Overall, though, it is a very good, versatile, 4k monitor that should please most people. 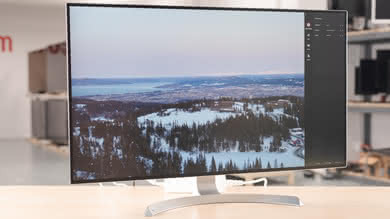 If you like the LG 27UK650 but want a larger screen and do not mind the extra cost, then get the LG 32UD99. 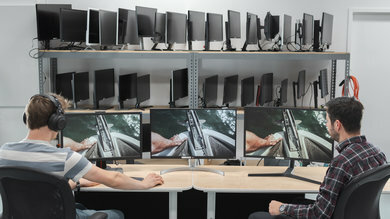 It is almost identical in performance to the 27UK650, but has a large 32-inch screen that favors multitasking as you can easily work on two windows side-by-side. HDR content looks slightly better on the 32UD99 due to the better color gamut and better color volume, although it still misses the threshold set to be considered a wide color gamut. It is a great monitor for gaming with a fast response time that makes fast-moving content look crisp. It has a low input lag which makes the monitor very responsive. Also, the 32UD99 has a USB-hub on the back that can be very handy if your PC does not have enough USB ports to accommodate all your peripherals. 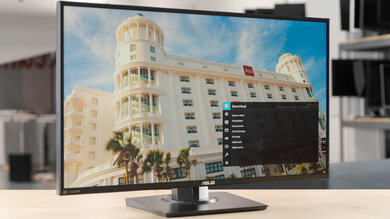 The ASUS VG279Q is the best PC monitor for gaming that we've tested so far. 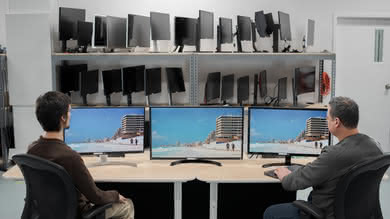 It has excellent wide viewing angles, a great stand with outstanding ergonomics, and excellent motion handling. 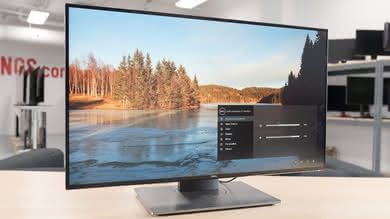 It supports FreeSync variable refresh rate technology, even when used with a 10- or 20- series NVIDIA graphics card, making it a versatile gaming monitor. The VG279Q has an extremely fast response time, so there is very little blur behind fast moving objects in movies and games. The backlight is flicker-free, so there are no distracting duplications in motion. It also has a fast 144Hz refresh rate, great for even competitive gaming, but there is no optional factory overclock. Unfortunately, like most IPS monitors, the VG279Q doesn't look as good when displaying dark scenes in a dark room. It is also limited to a 1080p resolution, which may disappoint more serious gamers. Overall, though, it is a great PC monitor that should please most people. If you want a great gaming monitor that natively supports G-SYNC to match your NVIDIA graphics card, check out the ASUS ROG PG279QZ instead. 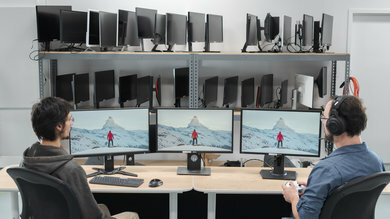 Overall, the PG279QZ performs very similarly to the VG279Q, but has a higher native resolution. The PG279QZ also supports NVIDIA's G-SYNC variable refresh rate technology instead of FreeSync. Overall, though, the PG279QZ is a very similar gaming monitor, and it should please most people. 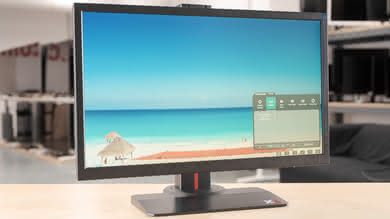 If you want something cheaper and are willing to compromise in size, then get the ViewSonic XG2402. It is a 1080p TN panel monitor with decent overall picture quality. 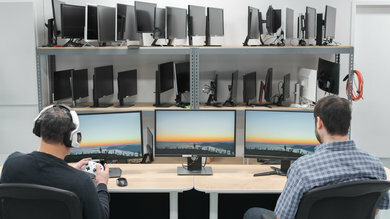 It can get very bright and can handle reflections well, so it is more suited for gaming in a bright room. 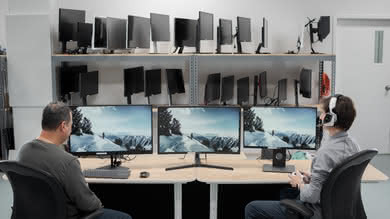 It has bad dark room performance and you will have to sit directly in front to have an accurate image. The XG2402 is great for gaming due to the excellent low input lag and the outstanding response time that makes fast motion look crisp. It has a 144Hz refresh rate and supports FreeSync VRR, which is great if you have an AMD video card or an Xbox One. Input lag remains low even when refresh rate drops, which is great. 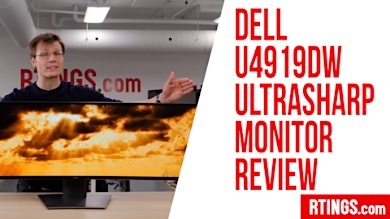 The Dell U3818DW is the best computer monitor for office use that we've tested so far. 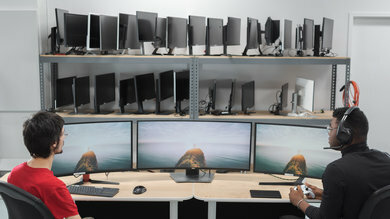 It has a huge 38" screen and an excellent 3840x1600 resolution that is excellent for multitasking. 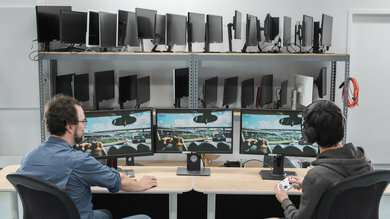 It also has a unique set of convenient connections that allow you to connect and work on two computers at once, without any additional equipment, even with just one keyboard and mouse. It delivers decent picture quality overall. It has great viewing angles, so you can share your work with a nearby coworker without having to swap seats or move your screen. 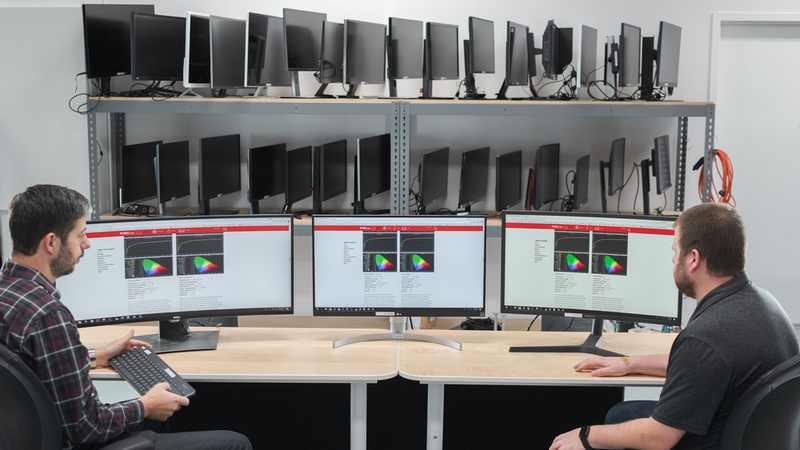 It also has a good stand that can be easily adjusted to an optimal viewing position, and it gets bright enough to handle glare in a bright office. Unfortunately, it doesn't look as good in a dark room. 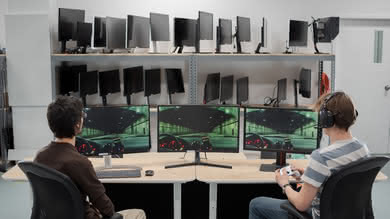 In addition, the U3818DW has only decent motion handling, so it isn't as good for gaming. 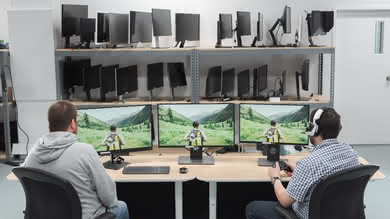 Fast-moving objects aren't very clear, as it has a slightly higher-than-average response time, and there is some motion smearing due to the monitor's severe overshoot. Some gamers will be disappointed by the simple 60Hz refresh rate and lack of variable refresh rate technology like FreeSync. 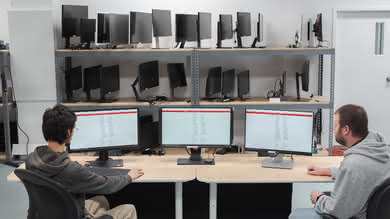 Overall, though, it is a great office monitor that should please most people. If you want a great office monitor, but the Dell U3818DW is too expensive, take a look at the Dell U2718Q instead. It is almost as good for office use. 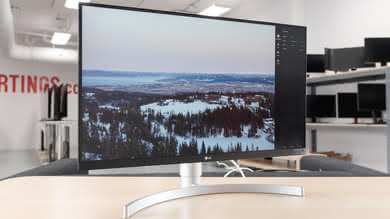 It has a smaller 27" 4k screen, which is still great for multitasking, and it has a great stand that can be easily adjusted to the optimal viewing position, or even rotated to a portrait orientation if you want to do a multi-screen setup. 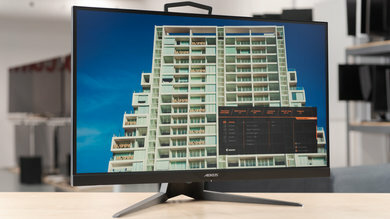 The U2718Q has very good viewing angles, although slightly worse than the U3818DW, and it has decent reflection handling, which is good for a bright office. Unfortunately, it has slightly worse connectivity, as it has only 1 HDMI port and no USB-C port, but this shouldn't be an issue for most people. The Dell U2518D is the best PC monitor in the budget category that we've reviewed so far. It is a very good, versatile monitor with a great stand, good picture quality, and excellent response time. 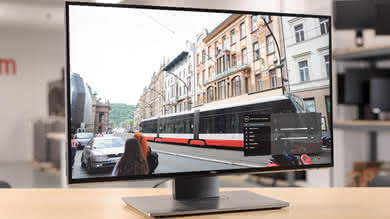 It has a great 1440p resolution that strikes a good balance between an ordinary 1080p monitor, and the higher performance requirements of a 4k screen. Despite the budget price, it has the same great stand and good build quality found on the majority of Dell monitors, which is great. The U2518D delivers good overall picture quality. It has great peak brightness and should look good in most bright rooms, but unfortunately it doesn't look as good in a dark room. 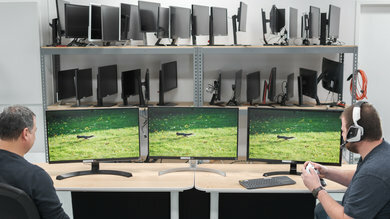 It has decent viewing angles, so you don't have to be sitting directly in front of the monitor for an accurate image. Unfortunately, the Dell U2518D isn't the greatest for gaming. Some gamers may be disappointed by the 60Hz refresh rate and lack of VRR. Although it supports HDR, it doesn't add much to the U2518D, as it doesn't have a wide color gamut and can't get very bright with HDR content. Overall, this is a very good, versatile monitor that should please most people. 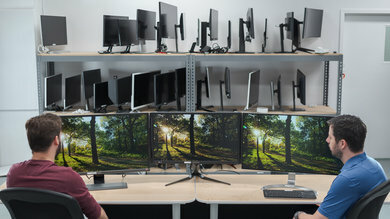 Our recommendations are based on what we think are the best monitors currently available. They are adapted to be valid for most people, in each price range. Rating is based on our review, factoring in price and feedback from our visitors.